In war there are no winners, yet peace seem so hard to embrace…maybe because it is so easy. Blogging educates, entertains and inspires me. These global connections should give us plenty of opportunity to spread tolerance, patience, kindness and peace. You’re right, Valerie. It begins with each individual. Thank you Lynne… at least it gives us something to do, instead of waiting for someone else to start the path to peace ! 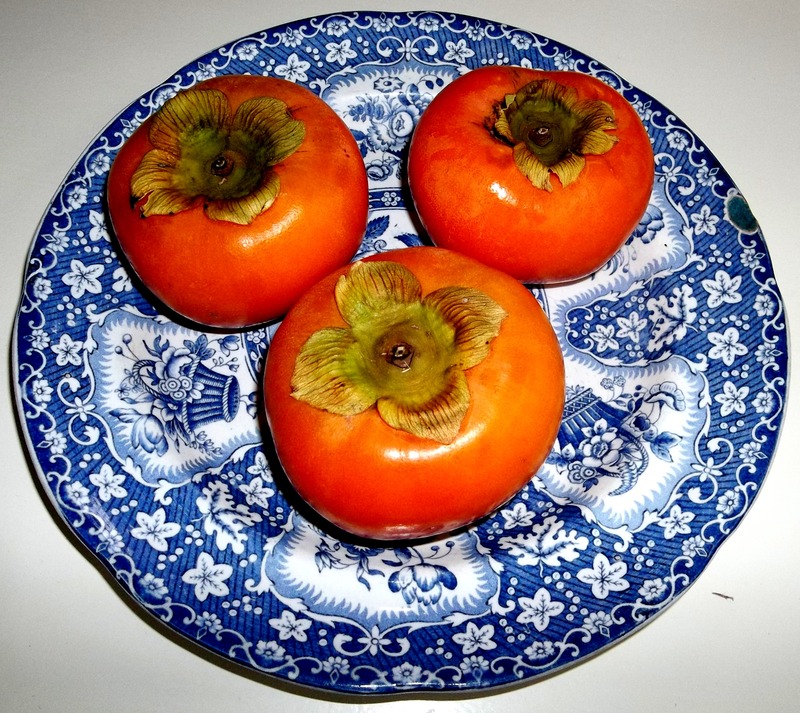 First: a joy to see the persimmons on the blue plate. I have half a persimmon on a blue plate next to me as a whole one was too large for me to finish at lunch time. I love the taste of persimmons but, even if I didn’t, I think I would still buy them just for the pleasure of looking at them. Second: I also find it hard to read books or stories or articles that are without goodness in them. Lastly, or really everlastingly, may peace be with you, and all of us, dear Valerie. Such a lovely comment, thank you… I don’t eat them, but do actually buy persimmons just to look at – have done every year for the last thirty ! but a few years ago I discovered that the birds, especially tuis, blackbirds and wax-eyes love them, so I nail one or two on the garden fence, and watch them out of the window! I so loved your last sentence, and wish I knew your name to wish you peace in person, dear friend ! I am smiling from ear to ear that you do actually buy them just to look at. Do you not like their flavour? The secret with the NZ persimmons is to eat them when they are crunchy or just barely past crunchy. To me they taste like a cross between a melon and a papaya with a twist of smooth creaminess. As for my name, I will give you a little word game because you are very interested in words. My real name means lovable or capable of being loved. Oh alas, I’m no good at puzzles, riddles or crosswords… all I can come up with are words for love, like amor, or caro… not Caroline, surely…. Well the amor is closest! As in amo, amas…..Actually that was naughty to tease you. I think you should have said “Rumplestiltskin” to teach me a lesson. Kind regards Amanda. Exactly… couldn’t get past the old conjugations ! Love the idea of Rumpelstiltskin… if you are anxious to maintain your anonymity I can call you that !!! I really don’t mind too much. I am very fond of my name. It is fun to be Gallivanta though. I used to have an elderly Italian friend and he loved to call me Cara, cara Amanda It sounded divine in his lilting Italian accent. I remember the day that I read the final page and closed the book on a best seller autobiography and said to myself: “never, never, never again will I ever read something like that again!” We have so little time that we must be careful to read only what is edifying, challenging, even difficult, but where the words bring joy and hope into our lives. Rebecca, thank you for your lovely words… I’m so glad you enjoyed the post. I found your re-action to the book you read fascinating… as you say, the negative is a waste of time, and also drags us down… The kitchen sink school of writing is rarely uplifting!!! Onward and upward is our path now !!!! How wonderful to dip into your blog and to read good news about special people who make a difference to the world in the most humble way. This post was balm to my soul, Valerie.And at the top I feast my eyes on my favourite winter fruit: persimmons. I hope you are having a gentle recovery from the dental work. Clanmother and Valerie, indeed the Angel of the Gap story is amazing. I read it aloud to my husband and daughter and my eyes strung a leak. What an amazing man and what a mission he and his wife had. I also admire him for his willingness to change his open-arms-with-hands-up gesture into a firm struggle to prevent the desperate to jump. For ever desperate soul on earth we need an Angel of the Gap, don’t we? Valerie, this is your second positive post on blogging and you have made me see blogging in a more positive way. I have always been afraid for vanity and narcissism after I read degrading comments on blogging in general. It was Lucy Kellaway in the Financial Times (I enjoy her articles) who said: ‘Everyone is blogging, carried away by the vanity of having an platform, and the fear of what happens if they don’t’. I’m afraid that for a whole lot of blogs she is right. I even tested myself to see if I felt bad about not blogging -taking a blog sabbatical- but I actually felt better with the anonymity. However, if you have a hobby or business or you love to share something, you are right in every sense that there is a kind and inspirational community out there willing to connect, give valuable feedback and share inspiration. Having said that, there are a lot of bloggers who mainly talk to themselves about themselves. Thank you for your touching stories and if there is one blogger who should continue to share, it is you. I feel I’ve been so fortunate.that the blogs I’ve been attracted to and the bloggers who’ve been attracted to me are written by such lovely people.. Thank you good friend….so good to know you’re there !!! Thanks for this post, couldn’t agree more with you! Lovely to hear from you… I love that story of the wolves… I’d forgotten it, and it’s always good to have a reminder, thank you…And of course it is so true…and is almost the answer to everything !!! Super post. There seems such a focus on the negative side of human nature and of life generally. How many ‘good news’ headlines does one ever see in the media? And, even with inspirational people, there is a tendency to scratch for, and trumpet, the Achilles’s heel. Thank you so much for your comment,. so glad you enjoyed it… yes, I think we just have to make a point of avoiding the negative… which isn’t hiding one’s head in the sand, but taking sensible evasive action to stay positive oneself ! The great joy is having the capacity to find a positive twist to many stories and experiences. The challenge is keeping positive when your spouse is negative and pessimistic. I love your post, and find it beautiful, sincere and uplifting. Thank you so much for your comment, Ronnie… I do know the challenge of living with a pessimist ! It’s a constant reminder in staying positive oneself !! Dear Valerie, as always reading your post has given me not only food for thought but a positive start to my day. Some people don’t understand how standing for peace and kindness by spreading great human stories make a difference but it does. Every single thing counts. Today I am wiser and more determined than ever to continue to spread the word of peace, kindness and understanding. Thank you. Such a beautiful post, I had goose pimples on my arms reading it. I rarely comment but I just had to do this, you’re an inspiration Valerie and people like you do make a difference! Hi Valerie, “And blogging is an education.” Reading your kind words, beautiful stories, food for thought.., like hearing “The Sound of Water” (your beautiful book). I always feel I am educated, inspired, and uplifted after visiting your blog. Thank you so much for the re-blog! Hope everything is going smoothly for you the rest of the week. Had not been the WP blog connection, I’d be staying in line forever to get to talk to you 🙂 I’m so grateful… Thank you so much for visiting my humble blog. Oh, Valerie! Thank you once more for an outstanding post! I, too, think blogging is creating a village of us in the world. I have been so delighted and stunned by the goodness and the connection that I have had — and still have– with people near and far, here and there, all around the world. LInda, thank you as ever… yes, blogging is such an unexpected treasure isn’t it, and people who don’t blog have no idea of the rich and full alternative life we all live !!! Thank you for sharing the story of the man who watched the bridge. What a beautiful soul. Valerie, this is beautiful. As I was reading a discussion on a recent post on my blog, I thought about a woman I have met who represents for me the sort of people you have written about here and decided to write about her this weekend. Thanks for reinforcing my decision to write about her for my next post! Luanne, – first of all, how good to be able to use your name ! So glad you enjoyed the blog… it’s the joy of blogging that we all spark and stimulate and inspire each other isn’t it ! You have such a great writing skill Velma and the part of this post concerning blogging is wonderful. I have also found love, kindness and fun. We are also giving the choice of pick and choose which blogs click with us and we are able to go even deeper by liking, commenting or emailing from which bonds of friendship form. Love to my friend. So beautifully said, Valerie, and so very true! Another beautiful post, Valerie! I have been wondering if above part is a general truth, though. For example: if we don’t criticise the self-imposed world government (Bilderberg Group) who managed to ruin democracy world-wide and triggered the world-wide crisis (all details of evidence on my blog) and if we only write kind words about them – would they be so kind to stop their project, to stop killing many millions, and instead just live and let the others live? I seriously doubt it. No I was thinking of individuals. I agree that we have to resist tyranny in whatever form it appears…No – kindness is not the answer to tyranny ! I think your blog does valuable work in bringing all the misuses of power to our notice…. Thank you for your lovely, empathic response, Valerie. Your supporting words arrived at the time when I needed them the most. I do have to admit, what I am craving is peaceful blogging in havens like your inspiring pages, and it feels lonely to deal with those thorny issues. Yet, I feel I need to fill the gap, because with each day I discover more that confirms my concerns, and because I think we need more voices out there to preserve our freedom and reverse the current process. It is probably because people tend to believe the myth that democracy something that is done for them, not by them. Another myth is equating democracy with casting our votes in every 4 years – not many are aware that people under the communist dictatorships were allowed to do that much: to cast their votes for their leaders. Any “democracy” where the majority don’t realise that they are the bosses, not their elected representatives, is doomed to death. If not even the free spirited bloggers can be moved to join the quest to save our freedom, then who can be? Thanks so much for listening and for your understanding – for allowing to pour my heart out. Apologies for not replying sooner I’m struggling with my second week of unresolved dental issues, and hardly coping ! I really valued what you had to say, and it was a privilege that you felt like sharing it with me. I know it’s easy to feel discouraged, but know that you are in the right place at the right time, and what you do is really valuable…I just hope you know that the cause is not lost- that there are many others who in their own way are doing their best for the world too. Brilliant post, Valerie, saying all that Ithink and feel about blogging and the friends I ‘m making through becoming a blogger. I was trying to explain to one of my daughters today why I make time to blog every day and how I love the comments and conversations that start. Tomorrow I shall give her your blog to read. Thank you for those two life affirming stories too and for another tasty sounding recipe though I’m sorry that your visit to the dentist was the reason for the meal. I hope your mouth is feeling much better by now. Hello Sally, thank you so much for your lovely comment… yes, it’s hard to explain to non-bloggers what a rich slice of life and enjoyment and stimulation we enjoy when we become bloggers, isn’t it ! Thank you, all is well after the dentist now – until tomorrow ! Last visit ! Wishing you good health for the teeth, too. Thank you Valerie for taking the time to read and “like” my posts, which brought me here to read this beautiful post about something very dear to my heart. I sign off on all but a few professional emails with “Peace” in the hopes that even that small act may bring a little more of it into the world. I love that you have made the connection between blogging and the influence we can have on the world, if we so choose. Oh, I love Persimmons…too bad they are so…sweet. I have to persimmon responsibly! Yes, that’s what I’m going to do! Even the word persimmon is beautiful, isn’t it George!